They're as sassy as their zine. When I think back on how to describe my correspondence with Hannah Presdee and Camilla Frankl-Slater, the first word that comes to mind is "delightful." I always ask if there's anything our Girl Spotlight in question would like readers to know about them, and Hannah responded with, "I used to compete in dance competitions! I had to wear bright pink glitter all over my body," while Camilla informed me of her housemate's ability to recite every word of R. Kelly's "Trapped in the Closet" through part twelve. Instead of rattling on about artwork and the creative life that inevitably follows (which, don't get me wrong, is incredibly interesting and quite personal), either girl was quick to provide a fun, quirkball response that immediately clued me in to their personalities. 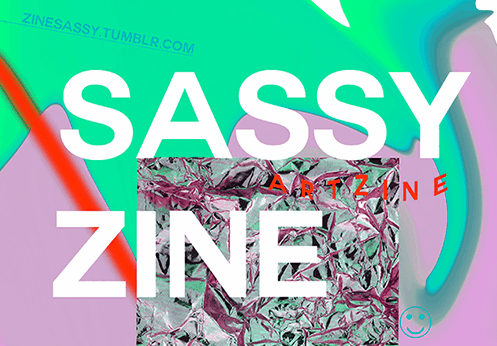 While Hannah and Camilla are both artists in their own right (you'll see some of their work sprinkled throughout this post), they've also started Sassy Zine, an art zine that aims to give attention to new artists. This is done through the breaking up of sections by each artist, highlighting their work and again, seeing its creators fall behind the lines. They're two girls, doing great things, and above all, working to get everyone's name out there, not just their own. Tres refreshing, no? Now on its second issue, Sassy is going strong, and it's lovely creators are going even stronger. Gawd, that was cheesy. THE LE SIGH: How did Sassy zine get going? Hannah Presdee: Camilla and I always talked about collaborating on something last year. We spoke about collaborating on something fun that reflected our similar interests, which is when we came up with the idea of making an online zine. Camilla Frankl-Slater: I can't remember a specific point when Sassy started. I wanted to make a zine with someone whose work I respected and also enjoyed being friends with. I think Hannah and I have similar feelings regarding illustration and design practice, and it felt like we should just make something. TLS: How did you guys become friends and how do you work together to create Sassy? HP: We met in our first year of university in halls and then we lived together for a bit last summer. We'd stay up drawing all night listening to Fleetwood Mac and Blu Cantrell. When we do Sassy, we communicate online or work together to look at the work that has been submitted. It's fun, because we always make a night of it – lots of pizza, beer and chocolate. CFS: Yeah, I was in halls during my foundation year when Hannah was in first year. Then I lived in Hannah's house for a few months when I was more or less homeless. We work on the zine when we aren't busy which is usually at different times, so often independently of each other, but we contact each other online about it and meet up/eat ice cream. TLS: Sassy doesn't have a theme, which is really great in terms of creative freedom, but I can imagine it also being overwhelming for you. What do you look for in terms of submissions otherwise? HP: It was quite hard at first as there was so much amazing work to choose from. I think we enjoyed the idea of having the creative freedom from our submissions so the viewers could see the broad diversity of creativity out there. I find when looking through zines, or even artists' websites, I enjoy looking through different medias and design approaches to work, and this was the kind of approach we were after. We hope our next issue will have an exciting theme! CFS: Initially we decided not to have a theme because we are a new zine and wanted to give the freedom open to anything creative. The work we have put in the two issues, which are currently online, sit well with each other without one. In terms of submissions, we sit together and look through all the work and pick out what we find interesting. We both have similar tastes so it has worked out pretty well. I also love looking through submissions because there's been a lot of work that's inspiring to us but also to our readers. Dilesh Patel's photographs of a hot air balloon in the first issue, Bob Schofield's comics, Fred Tam's work, etc; it's been great so far. TLS: What was the inspiration behind the zine name "Sassy"? HP: We both share a love for glitter and Beyonce and we just have that sort of girly "sass" to us, I suppose. It felt right. CFS: We were super aware we were going to get asked this at some point. I think we actually thought of the name when we were getting Hannah's hamster and it's sassy as hell. TLS: What zines are you guys currently reading? HP: "Girls Get Busy" and "Illuminati Girl Gang;" they're a great platform for female artists to showcase their work. Oh, and it's not so much a zine, but I'm completely hooked on Rookie Mag! CFS: "Shabby Doll House" was the last zine I read. I like "Sad Girls" zine as well; everything in there is beautiful. TLS: How does both of you being artists influence how you manage Sassy and the artists you choose, if at all? HP: At art school, we're around a diverse group of designers and illustrators so this helps a great deal when looking at work. 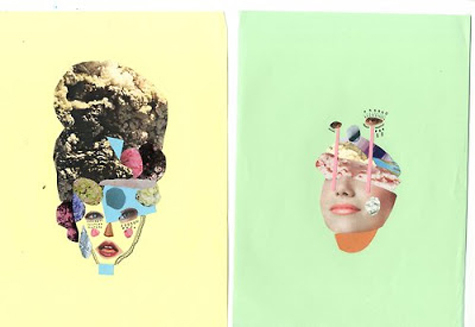 Where Camilla studies illustration and I study Graphic Design, we both have a diverse eye when looking at submissions. It works well when combining our interests and studies together. Also I just love looking at design and beautiful work; it excites me! CFS: Hannah and I look at a lot of work as part of our practice and also being surrounded by designers and illustrators helps us keep informed and comes in use when making a zine that calls for submissions. Mainly, I just want to make things I'm interested in, and am excited about a lot of other people who make stuff too. TLS: I love all the different artist bios included with each section. They're all really hilarious and, no pun intended, sassy. What would your guys' bios say? HP: Oh god, I'm so bad at writing bios about myself so I'll probably end up putting something ridiculously cliche. Like, "inspired by the world around me. I love animals, tea and pink," but I don't want to say that so maybe something like "life oh life ooohh life oh life do do do do" because life is like a box of chocolates. CFS: "Camilla Fs, pls go on her blog it's all she cares about." Check out both issues of Sassy Zine here.